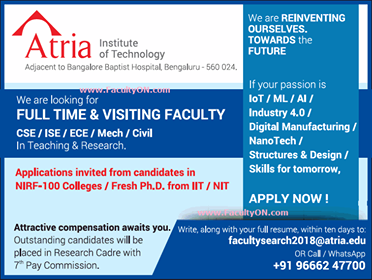 Atria Institute of Technology, Bangalore has advertised in Times of India newspaper for the recruitment of Full Time/Visiting Faculty jobs vacancies. Interested and eligible job aspirants are requested to apply with in 10 days. Check out further more details below. About College: The Atria Institute of Technology was established in the year 2000. Atria Institute of Technology, a unit of the distinguished Atria group. “A S Kuppa Raju & Brothers Charitable Foundation Trust” was founded in 1984. The trust owns and manage different educational institutions and has a rich experience in the area of education.